Speak to any graying man out there who wants more pepper and less salt in his beard, and they’ll all say the same thing. Managing those beard grays can be a tricky process. Thankfully, the #1 men’s hair & beard care brand Just For Men has come to the rescue once again, with the launch of new Control GX® Grey Reducing Beard Wash. Available now in stores across the country, Control GX® Grey Reducing Beard Wash works in exactly the same way as Just For Men’s award-winning Control GX® Shampoo. It reduces grays effectively and gradually over time, so guys can use the product daily until they like what they see. They’re always in complete control – which means they can be confident their beards will look and feel the very best they can. Control GX® Grey Reducing Beard Wash is made with an exclusive custom formula and patented technology specifically developed to penetrate and reduce grey in facial hair, which is coarser and more resistant than head hair. It’s also super easy to use, allowing for seamless integration into daily grooming regimes. All men have to do is massage a small amount of the formula into their beards, lather, leave for a few minutes, and then rinse off. And Control GX® Grey Reducing Beard Wash isn’t the only new addition to the franchise. Also available now is Control GX® Grey Reducing Anti-Dandruff Shampoo, a new stable mate for the much-lauded Control GX® Shampoo. Control GX® Grey Reducing Anti-Dandruff Shampoo works to combat dandruff and deliver subtle, natural-looking results. “Control GX® is rooted in innovation. The technology is incredible and the franchise has been a game changer for the men’s grooming category. It’s also been a huge hit with consumers, and understandably so. The Control GX® products are so effective, they work over a period of time and are easy to use. Beards are having a moment right now – they have been for a while – so Control GX® Grey Reducing Beard Wash was a natural next step in terms of new product development. Men needed it, we delivered.” said Ralph Marburger, VP Men’s Care at Just For Men. Both Control GX® Grey Reducing Beard Wash and Control GX® Grey Reducing Anti-Dandruff Shampoo are available in 4oz tubes and have a recommended retail price of $9.99. 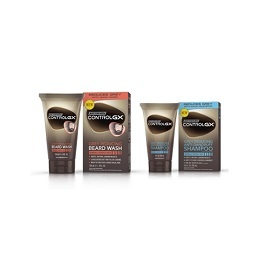 Control GX® Shampoo. It reduces grays effectively and gradually over time, so guys can use the product daily until they like what they see. They’re always in complete control – which means they can be confident their beards will look and feel the very best they can. Control GX® Grey Reducing Beard Wash is made with an exclusive custom formula and patented technology specifically developed to penetrate and reduce gray in facial hair, which is coarser and more resistant than head hair. It’s also super easy to use, allowing for seamless integration into daily grooming regimes. All men have to do is massage a small amount of the formula into their beards, lather, leave for a few minutes, and then rinse off. “Control GX® is rooted in innovation. The technology is incredible and the franchise has been a game changer for the men’s grooming category. It’s also been a huge hit with consumers, and understandably so. The Control GX® products are so effective, they work over a period of time and are easy to use. Beards are having a moment right now – they have been for a while – so Control GX® Gray Reducing Beard Wash was a natural next step in terms of new product development. Men needed it, we delivered.” said Ralph Marburger, VP Men’s Care at Just For Men. Combe Inc., “the most personal Personal Care company in the world” is a privately held manufacturer and marketer of personal care, beauty, and over-the-counter (OTC) drug products with leading brands in the men’s hair care and grooming, women’s health and oral care categories. Its men’s grooming brands include Just for Men, a trusted line of men’s hair care and facial care products. Founded in 1949, Combe Inc. is in the third generation of its family leadership, with global headquarters in White Plains, New York. To learn more about Just For Men, please visit JustForMen.com. To learn more about Combe Inc., please visit Combe.com.